Literally one of the best sandwiches I've ever had. That's no easy task, because it's hard to make a truly tasty vegetarian sandwich. But man, these guys do it right. Perfect balance of savory, tangy, and fried goodness. I try to go to this place anytime it's near my office. The chix panini was horrible. The chicken had a bad smell to it, no taste at all and they cover it up with this nasty mayonnaise like sauce. Will never order from this truck again. First time at this truck and it definitely won't be the last. It was really, really good, service was excellent. There are a bunch of things on the menu I'd like to try! The kafta had a good, fresh taste, and the size of the sandwich was reasonable for the money. The bread was so-so, seemed a little dry. Still, overall, worth repeating, and the service was friendly. This is a solid truck. Food has so much flavor! Bread was just ok. It was light and fresh, but nothing amazing. 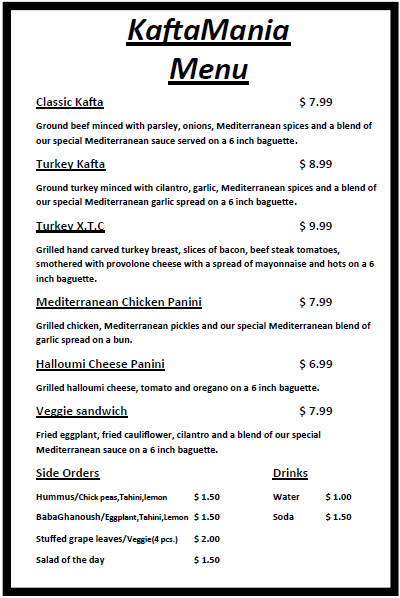 The toum on the sandwich was great. Hummus was yummy and not too garlicky. Portion size wasn't large so it's not a very good deal in terms of price. But it was yummy! Excellent! this was real halloumi. I thought the bread would be too thick, but they cook it perfectly. I can't wait to go back. Note: It's a very light sandwich, so if you're super-hungry you will be disappointed. Food: The turkey kafta was delicious. Great flavor with a hint of cinnamon or clove. The bread was perfect. Light crunch to the shell, fluffy interior bread, not chewy. The ingredients in the sandwich and the bread all worked together quite well. The baba ganoush was solid as well. My only complaint was there were not enough pita chips to go with it. I resorted to dipping my sandwich in it, which worked fine. Service: the guy working the window was very friendly and engaging. Food came out relatively quickly. KAFTAMANIA!! !Been waiting to try this new food truck because of some of the great reviews, and this truck did not let me down. "Turkey X.T.C"
Is This One Of Your Favorite Trucks? : YES!!! Been waiting to try this new food truck because of some of the great reviews, and this truck did not let me down. "Turkey X.T.C" was amazing! Rich and full for flavor. I have never tasted something so good that came from a food truck before. The sandwich is full of flavor till the last bite. "Grilled hand carved turkey breast, slices of bacon, beef steak tomatoes, smothered with provolone cheese with a spread of mayonnaise.." that just say nummnumm...num. I brought this sandwich back to my office and everybody eyes dropped! I'm looking forward to round 2 next week! I'm still full and happy and that's all that matters! Is This One Of Your Favorite Trucks? : It is now!!! 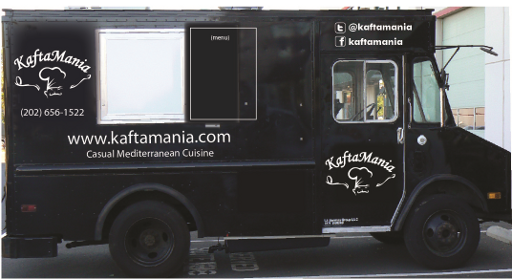 Kafta Mania food truck serves 3 versions of the Kafta Sandwich (Beef, Turkey, Vegetarian), classic Lebanese sandwiches and sides. They launched on Nov 7, 2012, serving DC, Arlington and Fairfax.